Gillyn graduated from the University of Georgia with a Bachelor of Science in Health Promotion and Behaviors in 2007. In 2011, Gillyn received her Doctorate of Physical Therapy from Georgia State University. During her time at Georgia State, Gillyn focused on research which included exercise programs to reduce fall risks in community dwelling older adults. 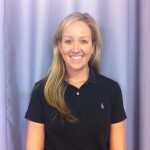 Gillyn currently practices at the Sandy Springs location and specializes in orthopedics and sports medicine. Gillyn’s clinical interests are post-operative rehab, sports related injuries, repetitive injuries, and postural dysfunctions. Gillyn has received advanced training in trigger point dry needling and manual therapy. Gillyn is focused on creating specific individualized treatment plans to help her patients achieve their highest level of function, return to sport, and achieve their specific goals. Gillyn is a member of the American Physical Therapy Association and the Physical Therapy Association of Georgia (PTAG). Gillyn also currently serves as a board member for the Physical Therapy Association of Georgia and is the director of the greater Metro Atlanta District 6. In her free time, Gillyn enjoys running, hiking, spending time on the lake, and rooting on her favorite Georgia Bulldogs during football season.